It was thirty years ago that Espace first emerged, a brand new kind of car that revolutionized the motoring world. Today it's metamorphosing as a crossover, consistent with customers' shifting expectations. New Espace breaks with the now-classic MPV format to take on assertive crossover looks. It measures 4.85 m long (in five- and even-seat versions) by 1.87 wide, which makes for a very generous interior. Design keywords are energy, personality and warmth. Exterior status features include signature DRL (daytime running lights), full-LED optics, wheels up to 19”, chrome side-window surrounds, and a panoramic windscreen measuring 2.9 square metres, extending to a fixed glass roof above the front seats. Five- and seven-seat versions of New Espace share the same body format. In either case, instant impressions on entering Renault's new crossover are of unmatched comfort and driving pleasure. A suspended central console highlighted by illuminated surrounds houses the large R-Link 2 multimedia screen. 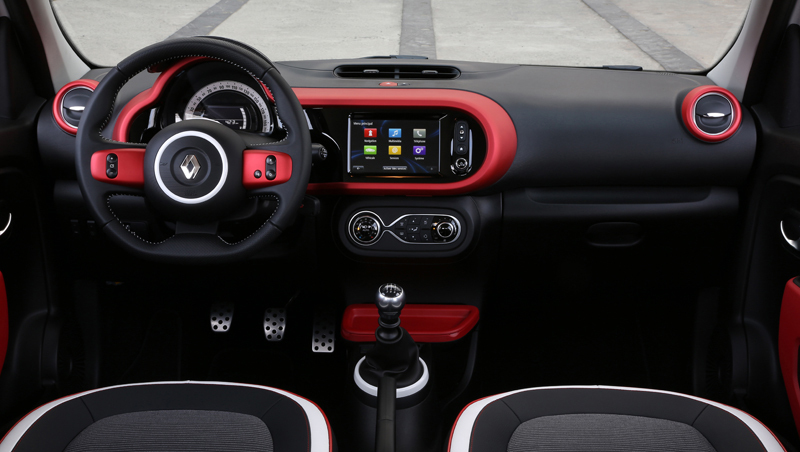 Personalized interior lighting adjusts to driving mode, set by the driver using the Multi-Sense® system. New Espace makes no concessions on interior space. Rear-seat passengers enjoy knee-room among the most generous in this vehicle category (up to 308 mm in the five-seat version). Boot space under the luggage flap measures 660 dm3 (on the five-seat version), huge for a crossover. True to style, New Espace does nothing less that reinvent the notion of interior layout versatility; with the One Touch system, the seats fold down in a single-click action, individually or together, controlled centrally from the R-LinK 2® system, from the luggage compartment, or directly on the seats. R-Link 2® uses an 8.7” capacitive screen for touch-sensitive zoom and menu scrolling. As well as the usual navigation functions and related applications, R-Link 2® also controls the car's extensive array of Multi-Sense driveability capabilities, such as the 4Control system, adjustable suspension, driver assistance functions, ambient sound and lighting, and even the front seat settings. With the Multi-Sense system, Espace fine-tunes to the driver's mood and wishes, by adjusting the settings for a whole range of functions, both technical (engine response, gearshift points on the EDC transmission, steering wheel stiffness), and perceptual (such as lighting tone, engine sound, and even the seat massage intensity). New Espace boasts comprehensive driver support and safety features including front parking assist, lane departure warning, and hill-start assist. Energy dCi 160 EDC, with Twin Turbo technology, coupled through the EDC transmission with Multi-Sense adaptability, a broad-appeal solution optimized for response and driving pleasure. Energy dCi 130, with six-speed manual gearbox, specially designed for customers, such as fleet operators, who put the priority on comfort and fuel economy. New TCe 200 EDC petrol engine, derived from the unit that powers Clio RS, coupled through Renault's new seven-speed EDC dual-clutch transmission, for incisive response and a firm emphasis on driving sensations.